Orbex unveiled its Prime rocket, powered by what has been described as the world's largest 3D printed rocket engine, at its new base at Forres Enterprise Park. Orbex said the rocket's engine was the first commercial rocket engine to be designed to work with bio-propane, a "clean-burning, 100% renewable fuel source" that cuts carbon. Orbex has also been selected by Swiss company Astrocast SA to launch as many as 10 nanosatellites by 2023. The satellites are part of a project to deliver affordable data communication services to the world's most remote areas. 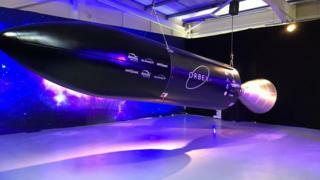 Graham Turnock, chief executive of the UK Space Agency, which is part-funding the spaceport, said Orbex's new rocket design facility brought Britain one step closer to having its own domestic commercial launch capability. He said: "The new facility and future spaceport operations will help unlock vast economic and societal benefits, not just in Scotland but right across the UK." Business Secretary Greg Clark added: "The plans for a spaceport in Sutherland have already attracted significant investment, and Orbex's rocket design facility will bring more than 100 new jobs to the Scottish Highlands region. "The space sector is a great British success story and we are working closely with industry to ensure we thrive in the commercial space age. "New innovations, capabilities and expertise are driving significant growth, with the sector generating close to £15bn in income each year." In December, Highlands and Islands Enterprise (HIE) started gauging company interest in designing, building and operating the spaceport in Sutherland. A planning application for the site could be submitted by the end of 2019. The project has support from local residents, but there are others in the area who oppose it. If built on schedule, HIE said the site could become the first orbital space launch facility in Europe. US company Lockheed Martin has proposed carrying out launches from the spaceport.